In 2016 and 2017 I had 3 blogpost about “Follow your Bliss” (“Happy Easter – Follow your bliss“, “Simploring 2017 (5) Follow your Bliss” and “Simploring 2017 (50) Follow Your Bliss (II)“). Sadly “Follow your Bliss” is longer existent. 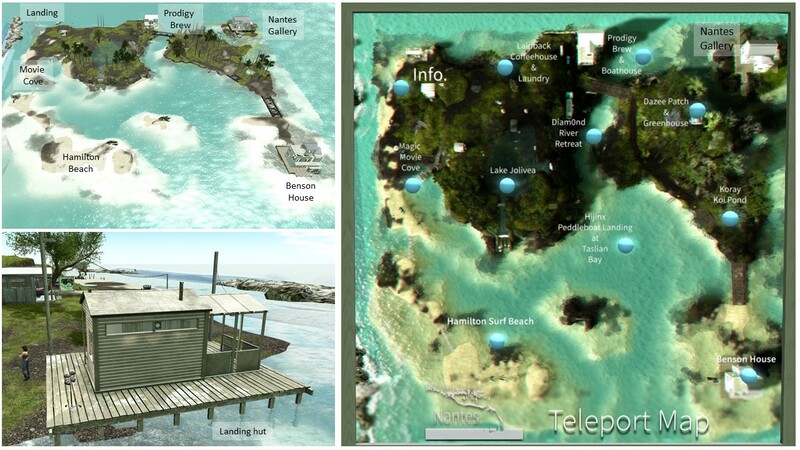 In the virtual world of Second Life places appear, change and vanish quite quickly sometimes. Hence it is good to keep some memories because they stay. But on the other side, the changes provide countless opportunities to discover and explore, the creativity in Second Life seems to be endless, which is not surprising as people from all over the world live out their dreams virtually. “Follow your Bliss” was created and owned by Ms. Nantes (elizabethnantes). As I still was a member of the according group, I got a message that Ms. Nantes has build a new place – Nantes. “I am opening a new sim, reminiscent of the original Follow your Bliss (+FYB+). Nantes will be group access only and there will be a small fee for the group to help offset the cost of staying open, I loved sharing +FYB+ with all of you and I hope you will enjoy Nantes as well.” The opening of Nantes was on July, 25th and I visited it July 26th/27th. The landing point of Nantes is in a small hut by the sea. Here you can join the group in order to be able to visit. The fee, Ms. Nantes mentioned above, is 250 L$ (approx. 1 US$) and will contribute to keep the sim alive. From here you can either start exploring on foot or you take the teleporter to Nantes Gallery or to Ms. Nantes store, e.posEd. The store is located in a skybox above Nantes and offers animations. The Nantes Gallery is located on the sim itself. I decided to explore on foot and not far from the landing hut I found a teleporter map, that gave me a nice overview. Yet I continued simploring on foot. Nantes is a group of islands connected by bridges, clearly dedicated for vacation or simply for relaxing and unwinding. It offers a nice beach with several different opportunities to sit (and cuddle). On a offshore sandbank (“Hamilton Surf Beach”) you also find several roofed wicker beach chairs, that are typical for Northern Germany and gave me a feeling of home *winks*. But there’s more. For example an outdoor cinema where you can watch youtube clips laying in the sun, called “Magic Movie Cove”. Or there is the “Lake Joliva”, a little lake with some toys and with animals to watch. Nantes has 3 major buildings and you can visit them all. The “Benson House” is a fully furnished residential house, the “Prodigy Brew & Boathouse” is a place to meet and chat in a nice and comfy environment, and the Nantes Gallery. The current exhibition at the Nantes Gallery is called “L’amuse Bouche”. L’amuse Bouch is French and means appetizer. What a great title for a first exhibition, that features the picture of several different artists. I admit that none of the names were familiar for me, but that might change in future. I finished me first visit to Nantes with a boat tour. There’s a peddleboat rezzer at “Taslin Bay”. And I was really not dressed appropriate for the peddleboating nor for the whole visit. Next time I’ll dress casually again and will wear my simploring sneakers! Nantes is, similar to “Follow your Bliss”, a place to unwind, to chat, to cuddle or for taking nice pictures. It’s a lovely place and I can only recommend visiting. I might return for another visit of the Nantes Gallery, if there’s an exhibtion that I want to see. Thank you Ms. Nantes (elizabethnantes) for providing Nantes to the public!